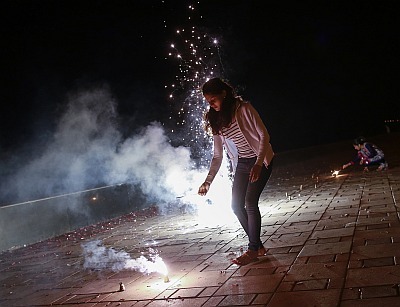 National Crime Records Bureau reports state-wise data on deaths due to Fireworks/Crackers. The map, above shows the number of firecracker deaths per 10 crore people and the 10 year change in firecracker deaths per 10 crore people. In the map above, size of the circle represents the number of firecracker deaths per 10 crore people across states in India. The bigger the circle, more the number of firecracker deaths per 10 crore people. The colour of the circle represents the 10 year change in firecracker deaths per 10 crore people. The darker the colour, higher the people killed over the period 2001 to 2011. Rediff Labs normalised the absolute number of firecracker deaths reported by NCRB by 10 crore people in every state. It turns out that the number of firecracker deaths per 10 crore people is highest in Chhattisgarh (86 deaths per 10 crore people), followed by Tamil Nadu (60 deaths per 10 crore people) and Delhi (54 deaths per 10 crore people). The 10 year change in firecracker deaths per 10 crore people in Delhi shows the largest increase (54 deaths per 10 crore people). This is followed by Jharkhand (34 deaths per 10 crore people) and Chhattisgarh (24 deaths per 10 crore people).